Remembering Astrid Kirchherr, the Woman Who First Photographed the Beatles—and Gave Them ... . Beatles Radio: The Beatles, Solos, Covers, Birthdays, News The Fab 4 and More! The Beatles will forever be known as the original boy band, a status they achieved only a few years after forming in Liverpool in 1960, when fangirls started fawning over John Lennon, Paul McCartney, George Harrison, and Ringo Starr. 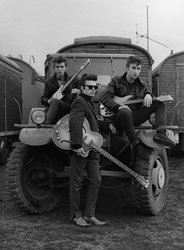 But before Starr joined the group in 1962, when Stuart Sutcliffe and Pete Best were still around, the men—or, rather, boys—owed a major part of their success to a woman: Astrid Kirchherr, a German photographer who first stumbled upon them when she heard music coming from a club in her hometown of Hamburg. After flattering them with a request to photograph the group, leading to a trip to a local fairground that would produce their first-ever group photo, she became intimately close to its members: She was, for example, the one to first cut their hair into their iconic mop tops, which were initially favored by the local German boys Kirchherr grew up around.